Representative Alexandria Ocasio-Cortez, a Democrat from New York, waves during the South By Southwest (SXSW) conference in Austin, Texas, U.S., on Saturday, March 9, 2019. Alexandria Ocasio-Cortez drew bigger crowds at South by Southwest than any presidential candidate at the annual festival of music, film and tech, NBC News reports. More than a half-dozen declared and potential 2020 candidates of all political stripes are making the pilgrimage to this mecca for upwardly mobile young techies and hipsters. 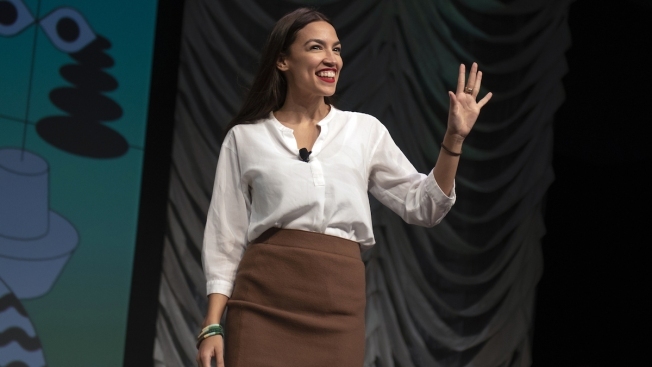 But Ocasio-Cortez, the 29-year-old left-wing Democrat from New York, was the star of the political track, attracting more interest Saturday than two senators— Elizabeth Warren and Amy Klobuchar — a former governor, a mayor and the former CEO of Starbucks. In her remarks, Ocasio-Cortez torched political moderation, which she equated with worshiping mediocrity, defended democratic socialism and took a question from Bill Nye, better known as The Science Guy. "Moderate is not a stance. It's just an attitude towards life of, like, 'meh,'" she said, shrugging her shoulders for emphasis. "We've become so cynical, that we view 'meh,' or 'eh' — we view cynicism as an intellectually superior attitude, and we view ambition as youthful naivete when ... the greatest things we have ever accomplished as a society have been ambitious acts of visions."